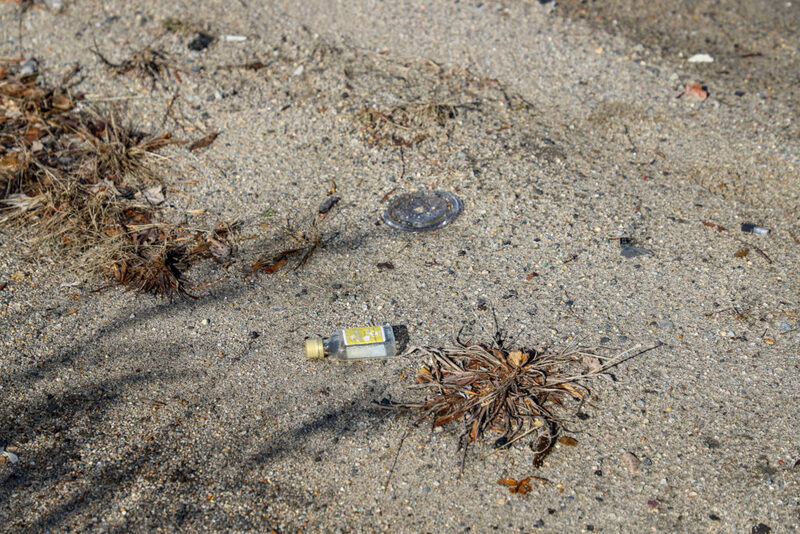 An empty nip, or small bottle of alcohol, litters the side of the road on Jan. 25, 2019. HALIFAX — The Halifax Board of Selectmen met Tuesday, Jan. 22, and discussed banning nips (small liquor bottles), a possible room tax option on AirBnB rentals and other such related services, as well as had a volatile discussion with Scott Clawson, of Plymouth Street (Route 106), and his attorney regarding a possible increase in the number of horse show days allowed at Fieldstone Farm, which he owns. Although not a formal public hearing, the board continued to hear from Scott Clawson and his attorney regarding a request for more horse show days than is allowed under a modified consent agreement approved by the Superior Court. The judgement between the Town of Halifax and Clawson, first agreed to in 1993, was signed and then updated following at least nine lengthy board meetings before August 2017, when a new agreement was signed into force. The current agreement allows 30 shows a year. Clawson is asking for 33 shows this year. His Stoneham-based attorney, Phil Taylor, asserted that the selectmen have the right to add additional shows under the agreement without going to court to modify the current agreement. The board said that two of the town’s attorneys disagreed with Taylor, saying that any changes to the consent agreement, should the board allow them, must be approved by the Superior Court. The board also made a “slippery slope” argument, all asking at one point or another if they were to allow three more shows, what would stop Clawson from asking for more in the future? Taylor argued at some length with the board, who were visibly and vocally frustrated, trying to convince them that their attorneys were wrong. He said that he did not have time to understand the town counsels’ rationale because he had not spoken with them. At several points, Taylor asserted that the capitalization of a letter in one line of the 10-page judgement changed the meaning of the agreement, causing stifled laughter from the board and Town Administrator Charlie Seelig. Taylor was successful in convincing the board to allow him to speak to one of the town’s attorneys– at taxpayer’s expense– to see if they could reach an agreement on whether the board or the Superior Court had the authority to change the consent agreement. “You’re a really good lawyer for Mr. Clawson, as I’ve pointed out before, but you don’t represent the Town of Halifax,” said Selectmen Chairman Kim Roy. Selectmen are interested in a suggestion from Seelig to ban the sale of nips, or small liquor bottles typically containing 50 milliliters of alcohol that are intended as an individual serving of liquor. They are often used by drivers who drink and drive, and then throw them out their windows, in order to avoid charges of carrying an open container if they are stopped, according to police. They are a frequent source of litter around town, said Seelig. He suggested that the best way to go about banning them would be to do so in concert with surrounding towns, otherwise people who intend to drink and drive while consuming nips will continue to buy them elsewhere and litter on Halifax roads. Seelig says the City of Chelsea has already banned nips and that a Halifax ban would be as simple as ordering liquor license holders in town not to sell alcoholic beverages under a certain number of milliliters. A rooms tax in Halifax? Although Halifax has no motels or hotels, it could still profit from a local option on a rooms tax, said Seelig. Services such as Airbnb, a San Francisco-based company which is an online marketplace allowing members to offer lodging, primarily homestays, to strangers, is being taxed at 5.7 percent by the state beginning in July, the same as hotels. Localities will have the option of charging a local rooms tax up to a maximum of 6 percent, he said. The tax, at the state level, has caused much controversy, and was fought by AirBnB. Although the board took no action on the proposal yet, it is something they will continue to discuss in the future. The board may hold an emergency meeting to deal with Fieldstone Farms before their next regularly scheduled meeting on Tuesday, Feb. 12, at 7:30 p.m. in the Selectmen’s Meeting Room of the Halifax Town Hall.